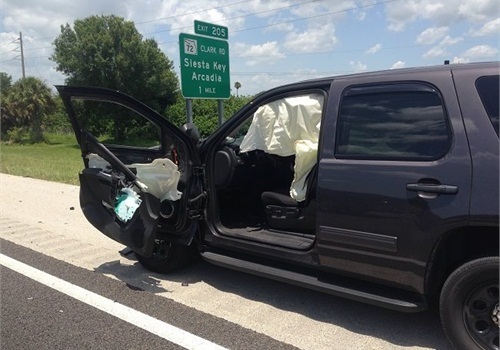 A Sarasota County, Fla., sheriff's deputy enforcing Florida's “Move Over” law received minor injuries when a passing driver who failed to obey that law struck his Sheriff's Office car. Deputies cited 77-year-old Robert Best of Ellenton for a move over violation, failure to maintain lane and leaving the scene of an accident with property damage. The Herald Tribune reported on Sunday, Deputy Chris Butler stopped a northbound car on Interstate 75 just south of Clark Road for a “move over” violation. Florida law requires drivers to either move one lane away from a stopped police or emergency vehicle with its lights on or slow to 20 mph below the speed limit. A 2001 Cadillac driven by Best struck the driver's door of the sheriff's vehicle as Butler opened it, a report states. Best failed to stop and, after being pulled over by another traffic deputy, reportedly said he was not aware that he hit anything.